For as long I can think I dreamt of Canada. My grandfather owned a large book called “The Canadian Rockies” by photographer Douglas Leighton and whenever I visited him I spent a fair amount of time looking at the images of this far-far-away mountain kingdom. I was not aware of it, but the pictures of the Rockies shaped my picture of Canada as a whole: a wild, grand and beautiful place like no other on our planet. It took me 27 years to make the dream come true and travel from Europe to Canada. It must be a stroke of luck that I did not take the most obvious route via Calgary into the Rocky Mountains, but opted for a rather long overture. Flying into Vancouver I planned to spend two weeks at the coast of British Columbia before heading inland to find the real world equivalents to the images of my childhood dreams. Early morning at the Queen Charlotte Strait looking from Vancouver Island to the central BC coast. The coast of British Columbia is the link between the US States of Oregon, Washington, and Alaska. It’s a region where the border between ocean and land is a thin red line. The coastline is formed by thousands of islands, bays, fjords, peninsulas and channels. The waters are home to sea lions, salmon and several species of whales. A few steps inland mountains raise that dwarf the highest peaks of the Canadian Rockies. Its flanks are covered with some of earth’s productive ecosystems, the largest temperate rainforest that’s left. Temperate rainforest can be found at the western edges (the rainy sides) of New Zealand, southern Chile or North America – and a very few other places. 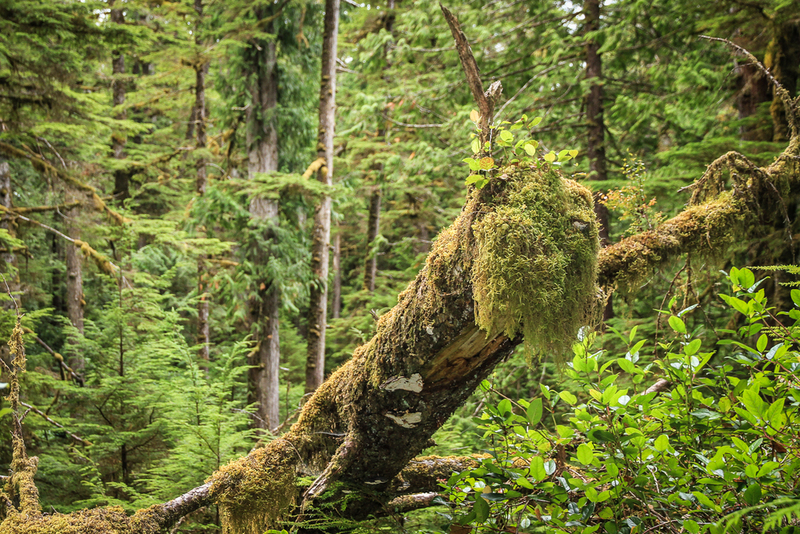 Major parts of the North-American temperate rainforests have been quite well protected, as National Parks in Canada (Pacific Rim and Haida Gwaii) and National Forests in Alaska (e.g. Tongass). At the same time, enormous areas of these precious, old-grown forests have been the bonanza of large timber enterprises that started to exploit the endless woods more than a hundred years ago. On Vancouver Island for example the untouched forest came down to a few patches and a larger stretch along the west coast. The Great Bear Rainforest is a vast and sparsely populated area north of Vancouver Island and bordering the Alaska Panhandle. It’s due to its remoteness and the difficult access – there is only one (gravel) road that connects the coast and the hinterland in several hundred kilometres of coast – that the process of logging has not been as devastating as on Vancouver Island or BC’s southern coast. Yet, the threat for this incomparable ecosystem was evident and so was the pressure to save it. On a sunny late-summer day in 2010 me and my wife left the courtyard of the RV rental station in Vancouver, made our way to the Tsawassen ferry terminal and across the Strait of Georgia to Nanaimo on Vancouver Island. After filling the storage compartments with snacks and supplies we started driving into the “wild”. Our plan was to take the famous Highway No. 4 to the Pacific Coast. Slowly the villages thinned out, the farmland gave way to soft meadows and some hills started to accompany the road. After turning onto Highway No. 4 and leaving the busy east coast of the Island behind the landscape changed rapidly. We entered forests, passed signs indicating waterfalls and had to bend down more and more to see the mountains from our windows. Only a few minutes later a rest area forced us to pull over and leave the vehicle. We stepped outside and walked a few meters down to the shore of Cameron Lake. It was there when it suddenly struck me: I felt Canada. I felt the grandeur, the freshness, the calmness and wonder. The mountains around Cameron Lake hardly reach 900 meters in height, nor is the lake one of the true gems of the Island – not to speak of the province or the country – but it will forever be the place where I arrived in Canada and saw a glimpse of what this means to me. New life coming from dead wood at the shore of Cameron Lake, MacMillan Provincial Park. A few meters further down the road we realized that Cameron Lake was indeed special. On its south-western shore it is surrounded by the “Cathedral Grove”, a small but incredibly impressive patch of old-grown temperate rainforest. Ironically, the official name of the grove is “MacMillan Provincial Park”. The timber company by the same name set up the park on both sides of the road to protect some of the tallest and oldest trees of the island (up to 90 meters and 800 years). Yet, this action does not appear to be more than a fig leaf that covers the massive logging the company was undertaking around the grove. Now 300 hectares in size, the grove is a small island of natural richness in the endless ocean of clearcuts and monotonous new-grown forests. I began to feel that there needs more to be done for these temperate rainforests than just protecting some small patches here and there. The grove was just large enough to mimic an intact ecosystem. Large ferns, massive tree trunks, new trees emerging from rotten woods, moss hanging from the branches – it’s all there, but in the end in isolation it’s nothing more than a single individual of an endangered species in a zoo. Over the course of the next ten days we deepened the first memories we made at Cameron Lake with exciting new ones on the BC coast. We hiked the roaring pacific coast near Ucluelet, lost ourselves in the rainforest of the Pacific Rim National Park, gazed at the wonderland of islands that surround Tofino, hiked the remote paths of the Strathcona mountains, looked down the churning Elk Falls and drove through never-ending rain to the northern tip of Vancouver Island. 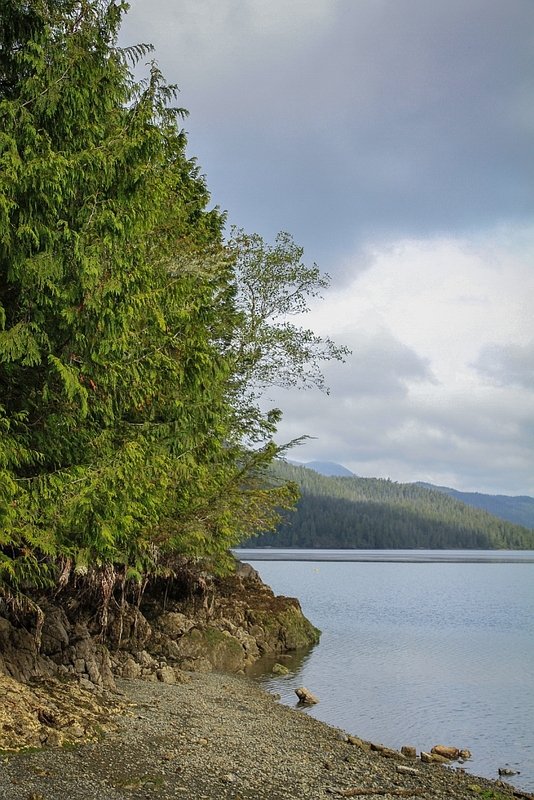 At Port Hardy we turned the page for the next chapter of our adventure as we set foot on a ferry that took us deep into the heart of the central BC coast, the Great Bear Rainforest. The 13-hour trip from Port Hardy to Bella Coola is part of the legendary Inside Passage all the way up to Alaska and is an experience that will leave you astonished and moved. Accompanied by Orcas and Humpback Whales we spend the whole day navigating through fjords, inlets and channels, never knowing whether the shore was belonging to an island or the mainland. The rainforest is covering the land almost entirely, leaving out only the steepest slopes and highest peaks of the granite mountains. The further we left Vancouver Island behind, the wilder the region appeared. Discovering a patch where the forest has been logged recently happened seldom, but was even more depressing. Here there was a paradise left, that could be saved, I felt. The logging patches looked like scars, that did not yet bring the whole organism down, but I knew that what I saw was only a fraction of what the entire rainforest may look like – now and in a few more years. Back home I researched quite bit on the Great Bear Rainforest, learned about trees that feed from salmon, about wolves and the elusive Kermode Bear – a rare white Brown Bear that the First Nations call “spirit bear”. What I also found was a very active network of NGOs, First Nations, individuals and other stakeholders that fought for a comprehensive protection area for the entire ecosystem. I immediately joined the support of the Rainforest Solutions Project. Attention faded and renewed over the years, but thanks to the initiative I never lost it. Now we are there – three million hectares forever wild. 10.000 Cathedral Groves. Mission accomplished. Vision realized. Wow. http://www.savethegreatbear.org/ The website of the Rainforest Solutions Project. http://books.wwnorton.com/books/The-Golden-Spruce/ One of the most fascinating books I ever read, a documentary eco-thriller following the life and death (?) of a BC activist and lumberjack. http://www.wildernessprints.com/index.html The website of immensely talented wildlife and landscape photographer John E. Marriot, who shoots regularly at the BC coast.